The second card here (another card I started a while ago...) uses the polished stone technique and reverse embossing, just like this card I made here. I used Creamy Caramel, Chocolate Chip, and Whisper White cardstock, and the inks I used include Choco Chip, Creamy Caramel, and Close to Cocoa. 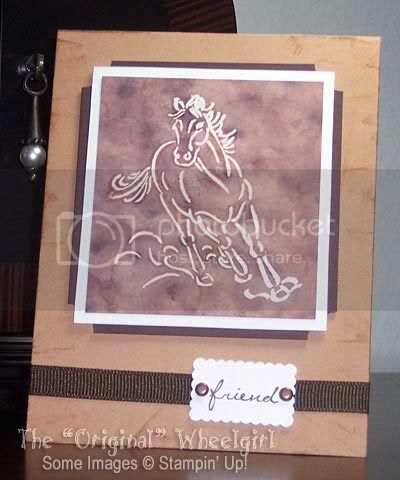 The horse image is from the Brushstroke Horses set from SU! The tag is punched out using the Marvy Extra Jumbo Scallop Rectangle Punch, and stamped with the "friend" stamp from the Noteworthy set by SU! I used the direct to paper technique to add a distressed look to the caramel card base using caramel ink. The brown grosgrain ribbon is wrapped around the card front and the ends are tucked under the tag and antique bronze brads hold it down. This next card is from Sketch #138, from a few weeks ago. I liked the sketch, and looking through my stamp sets I came across the Trick or Treat set from SU! and used the cat head. I've been dying to use this cat face for a while, and thought it would be cute with this sketch. I also used the striped scrapbook paper I used in the first card above! 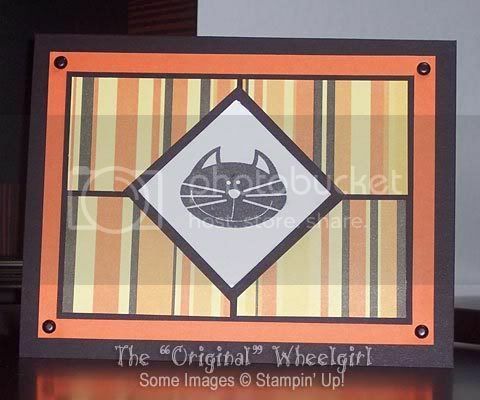 The cardstock is Pumpkin Pie, Basic Black and Whisper White, and I used Versafine Black inknk to get even coverage on the cat face, but it turned out kinda faded and looks kinda dark grey, which is fine with me. 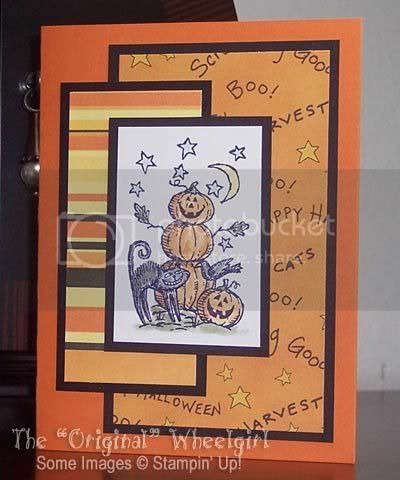 The final card I have for you was for the Limited Supplies Challenge #131, which was to create an Autumn card, and I chose to do the 3rd challenge, the tent topper card. I used another polished stone/reverse embossing technique using one of the outline leaves from the Lovely Leaves set from SU! I used More Mustard, Pumpkin Pie, and Old Olive inks to do the polished stone technique, and punched out a circle using the Marvy Mega plain circle punch. I cut a circle slightly bigger in Whisper White using my Coluzzle companion template to mat. Finally, the Giga scallop circle punch was used to add the Old Olive scallop mat. 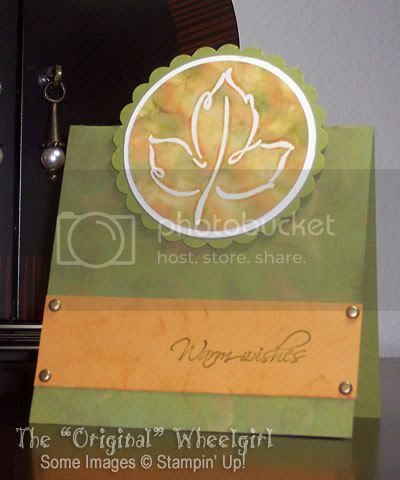 The card base is Old Olive with direct to paper streaks using ColorBox chalk inks in autumn colors. I cut a strip of More Mustard and swiped it with More Mustard ink and stamped "Warm Wishes" from the Hugs and Wishes set by SU! in Old Olive. I added the antique gold brads to add a little somethin'.